Mosses and liverworts rarely get the same consideration that flowering plants do. It is odd how little we know about them. Last week I went to the Delaware Water Gap to search for a group of rock-dwelling mosses believed to be extremely rare in our area—the Andreaea species. 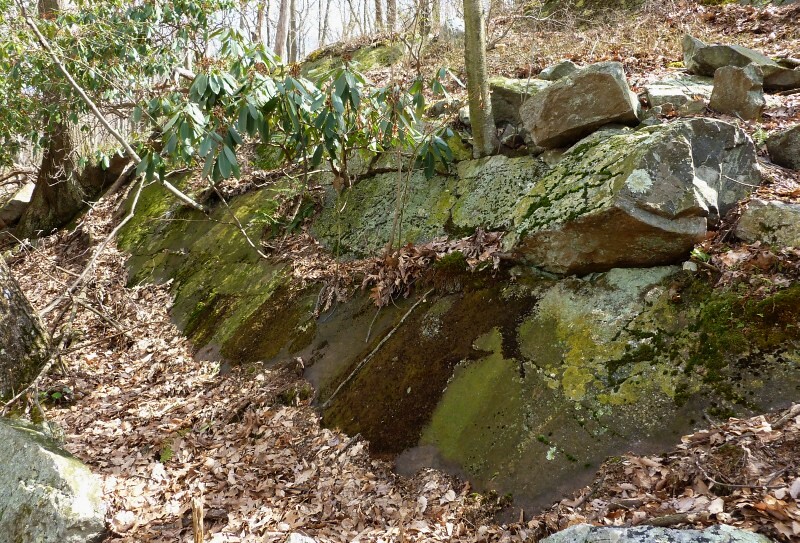 The last report of this moss from the Water Gap was from Professor Thomas C. Porter of Lehigh College in the 1870s. Unfortunately, he did not give a precise location, so I will have to find it by looking for the right habitat. I have been compiling an inventory of the mosses and liverworts in our region and most of the data we have is more than a hundred years old, assembled by the naturalists of an earlier time. I want see if these plants still exist and find out what is growing here now. At the Water Gap, I decide to try the slopes of Mount Tammany, on the New Jersey side of the Gap. I already know that the nearby ravine of Dunnfield Creek is the home of other species of rare moss. The habitat I am looking for is an outcrop that is wet by slowly seeping moisture from above and small enough to be in the shade. The ridge and the east face of the mountain are too dry and exposed, so my best chance will be on the west-facing slope below the ridge. I climb along the blue trail, which starts northward along Dunnfield Creek then turns to the east and climbs the west slope of Tammany. The creek bed cuts through layers of red sandstone that are covered with mosses, liverworts, and ferns. 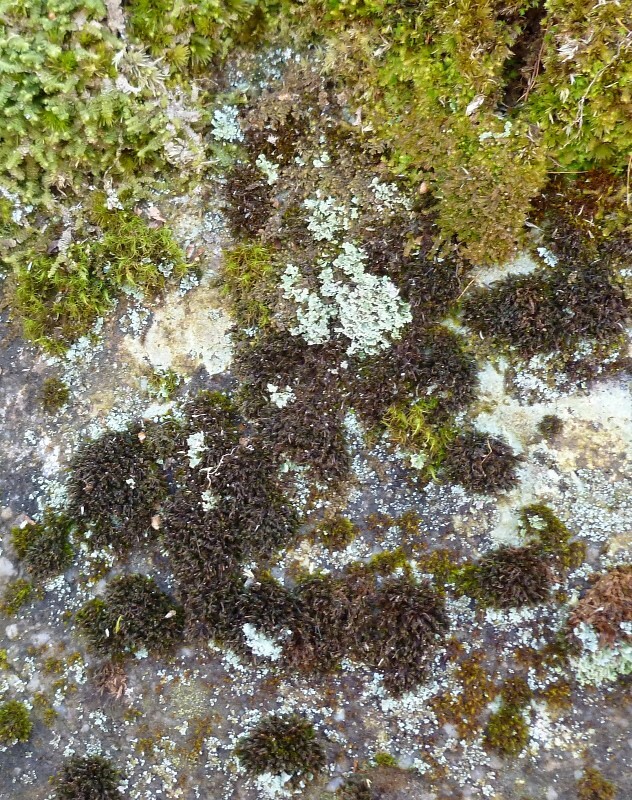 There are some interesting species here, including Anomodon, the tree skirt moss, and the rare species Forsstroemia trichomitria, growing on the side of a limestone boulder that must have been dropped here by the glaciers. Even the exposed trail sides are covered by a mixture of mosses and liverworts. Sometimes there are a half dozen species or more growing in a space you could cover with one hand. About halfway up the hill, the red sandstone drops away, and the color of the rock changes to the gray of the Shawangunk sandstone that crowns the hill. This is the rock you see in the dramatic bands that rise up from Route 80 where it cuts through the Gap. It is here where I think I will find my moss. I have seen the species before growing on similar stone to the north in the Catskills and Shawangunks. The woods here seem oddly young, as if they were recently cut and are regenerating. This is state land, though. I don’t think it has been cut for at least a hundred years. I measure some of the trees, then sit on a log to tally the results and try to solve this puzzle. Most of the trees around me are young black birch, the species that grows up quickly after a harvest, but the few big trees are all oaks, many more than a century old. These would have been cut if the woods were cleared. Why this odd mix of the very young and the very old? Then I realize that I am sitting on my answer: the log. My seat is the trunk of a fallen hemlock. A few decades past, hemlocks would have dominated this slope, but most have fallen victim to the wooly adelgid, an insect that grows in masses on hemlock twigs, feeding on sap. All around me in the woods are the trunks of the fallen hemlocks. The birches are growing up to replace them. I continue up the slope, searching back and forth for rock outcrops. Then, just below the ridge, not far off the trail, I see a short, broad outcrop covered with mosses. Off to one side is a dark reddish-brown patch, almost black. The individual plants of Andreaea are tiny, an eighth to a sixteenth of an inch tall, but they grow in dense, dark clumps and mats on the rock. A look through my magnifier confirms the find: the characteristic capsules, with a tiny white dot at the top, and the large leaves that surround the capsule stalks are clearly visible, even if they are so small that they are almost at the limit of my vision. I wonder if this was the outcrop Professor Porter saw, if these were the descendents of the plants he recorded. The nearby trail is old and deeply worn. It could have been the trail he took. Mosses found, I continue on to the top of the hill. It has taken me more than three hours to make it up with all the searching along the way. The map says that the trail is two miles from creek to peak, but my GPS says that my wanderings have taken me almost five. At the top, I am rewarded with a fine view across the Gap to Mount Minsi on the Pennsylvania side, Tammany’s twin. Mr. Barringer, thank you for this fascinating illustrated post. Please post more. Our local natural history and native species are in serious need of care. 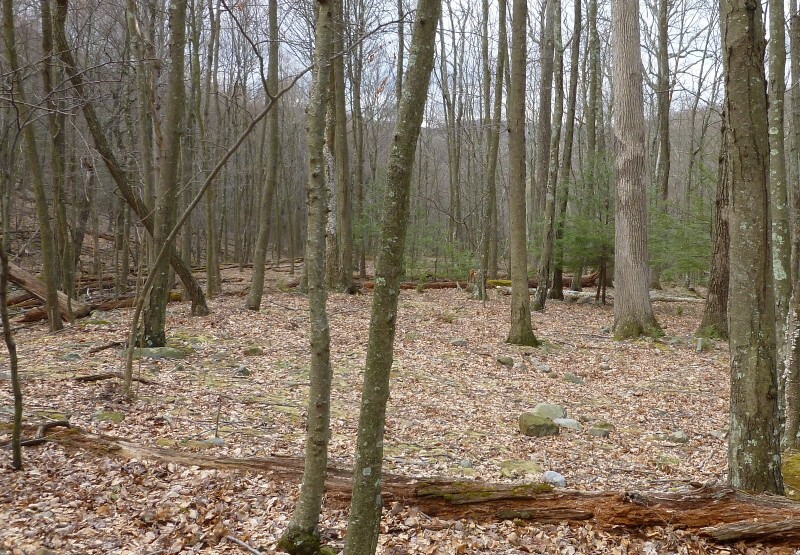 Young trees on the west slope of Mount Tammany in New Jersey. Photo by Kerry Barringer. An outcrop covered with mosses, including the rare Andreaea species. Photo by Kerry Barringer. Andreaea, a rare moss species, growing on an outcrop on the west slope of Mount Tammany. Photo by Kerry Barringer.